Will a long dormant franchise take the top spot at the box office this weekend or will yet another R-rated comedy make a splash? As we head into the final few weeks of summer, quality movie offerings are in short supply. Here’s how Biff Bam Pop sees this weekend turning out. It’s been ten years since Tim Burton’s Planet of the Apes hit theatres and in the ensuing time, I don’t think anybody has been itching for another film in the franchise. Though it did well at the box office, there just wasn’t enough interest from audiences of the filmmakers to warrant a sequel. 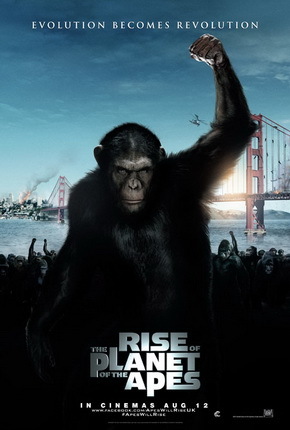 Instead, Fox has gone the prequel route with Rise of the Planet of the Apes, directed by Rupert Wyatt (yeah, me neither) and staring James Franco, Frieda Pinto, John Lithgow, Brian Cox, Tom Felton and the motion capture work of Andy Serkis. The good news is, the trailers for the film have looked great, offering up a dark and ominous tone, something we really haven’t seen this summer from any blockbuster. You’ve also got a solid cast of actors on screen. However, arguably none of them are box office draws (not even Tom “Draco Malfoy” Felton). In fact, after the Oscars debacle, I think there’s a serious hate on from audiences for James Franco. With a lack of superstars either in front or behind the camera, I don’t think Rise of the Planet of the Apes will draw the way Burton’s Mark Wahlberg-staring reboot did a decade ago (it opened with $68 million). Look for the film to hit the top spot with $40 million. 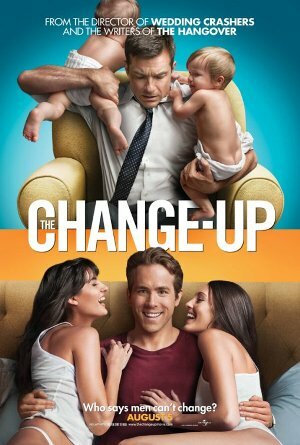 The Change-Up is the other new release out, and stars Ryan “Please don’t mention Green Lantern” Reynolds and Jason “I don’t when we’ll make an Arrested Development movie” Bateman as two old friends who, upon peeing into a wishing fountain, wish that they had each others’ lives. The next morning they wake up in each others’ bodies. I’m assuming hilarity then ensues. While The Hangover 2, Bridesmaids, Horrible Bosses and Bad Teacher have all done great business this summer, I think that this latest R-rated comedy is going to underwhelm. There hasn’t been a ton of strong marketing for the film and neither Bateman or Reynolds are huge stars. In fact, both have already had films out this summer (Reynold’s aforementioned comic book flick and Bateman in Horrible Bosses), so I’m guessing audiences could very take a pass on this one. Look for The Change-Up to debut at number 3 with $19 million. As for the rest of the top five, I think we just might see a surprising hold from The Smurfs, the one big family film out in theatres at the moment. Less a million dollars separated it and Cowboys and Aliens last weekend, and the movie has been of top of the box office throughout the week. Look for The Smurfs to take the number 2 spot with $21 million. Cowboys and Aliens may have been number one last weekend, but $36 million was nothing to brag about. Look for the film to drop significantly in its second weekend, bringing in $15 million to land at number 4. Rounding out the top 5 will be Captain America: The First Avenger with $13 million, as it struggles to reach the $180 million from fellow Marvel Studios film Thor. Check back on Sunday to see all the box office results!